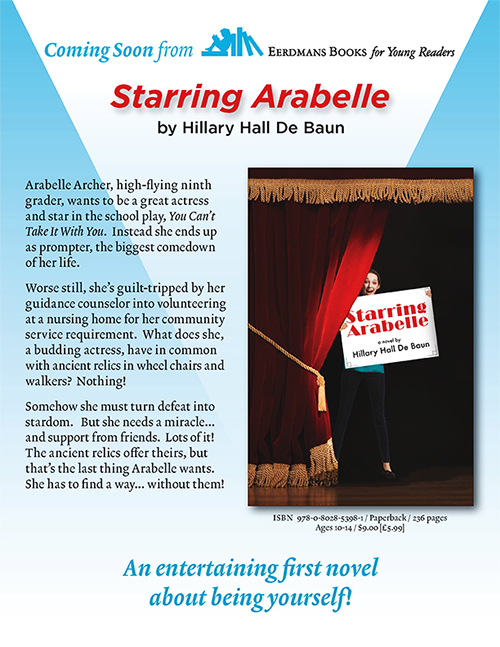 Starring Arabelle, my debut novel, offers two themes in this comedy of errors. One is the three-ring circus of staging You Can’t Take It With You, the high school play that Arabelle longs to be in; the other involves the comic goings-on at the Heavenly Rest Nursing Home that mirror the nutty antics in the play. I hope the similarities between the two will tickle your fancy and keep you turning pages to the very end. But Arabelle’s year gets off to a rocky start when all the roles in the play go to upperclassmen and she has to settle for prompting. And to make matters worse, her guidance counselor insists that she fulfill her community service requirement by volunteering at the Heavenly Rest Nursing Home—the last place on earth she wants to be. When, unexpectedly, a crisis puts the school play at risk, and Arabelle is caught in the middle, she discovers that making a lasting impression isn’t always about being a star and that her biggest fans are the friends she’s made at Heavenly Rest.